Tanghalang Pilipino (TP) pays tribute to the stage artists of yesteryears through its 3rd theater season offering entitled Stageshow, a grand musical play slated on October 10-21, 2012, 3pm and 8pm, at the Cultural Center of the Philippines’ Tanghalang Aurelio Tolentino (CCP Little Theater). “The play captures the essence of the people behind a stageshow,” says Fernando “Nanding” Josef, TP’s artistic director. 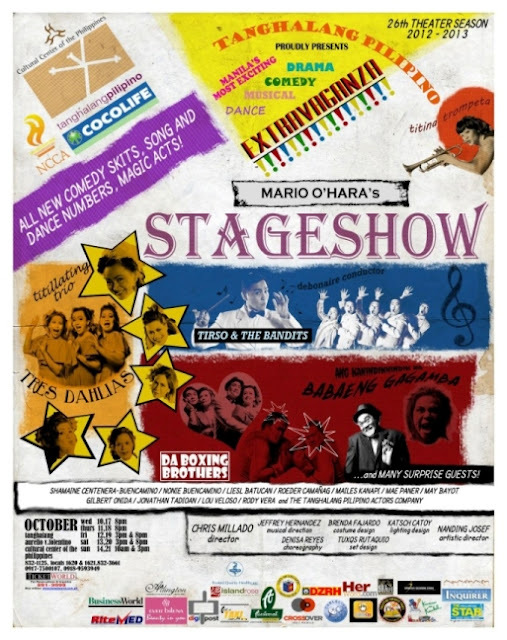 Nanding divulged that Mario O’Hara wanted to illustrate how these stage shows and their artists evolved from popularity to obscurity. Mario O’Hara’s Stageshow topbills the talent and versatility of TP veterans--stage/film/TV actors Shamaine Centenera-Buencamino and Nonie Buencamino, with Liesl Batucan and Roeder Camañag who will act as alternates. Joining the cast are Angelina Kanapi, Mae Paner, May Bayot de Castro, Rayna Reyes, Rody Vera, Lou Veloso, Gie Onida, Pam Hundana, Gino Ramirez, Jonathan Tadioan, April Iñigo, Tara Cabaero, Hazel Maranan, Kaye Garcia, Agnes Sarreal, Anthony Falcon and Aaron Ching. Directed by Chris Millado, Tanghalang Pilipino will also honor these stageshow artists in a “Gabi ng Pagkilala sa mga Beterano ng Stageshow” on October 13, 2012. The play is also an official entry to the National Theater Festival coming this November 2012. For ticket reservations, group sales, sponsorships, and special performances, please contact Ms. Cherry Bong Edralin at +63.917.7500107 / +63.918.9593949, (632) 832-1125 local 1620/1621. Tickets are also available at Ticketworld at (632) 891-9999 and at the CCP Box Office. Visit the official TP website at www.tanghalangpilipino.org.ph for other information.